On March 31, the Fashion Law Institute at Fordham Law hosted its seventh annual symposium, bringing together leading figures from fashion and law for discussions regarding the trends shaping one of New York City’s most vibrant industries. The day began with opening remarks from Fashion Law Institute Founder Susan Scafidi, who set the stage for five panel discussions concerning issues such as tax reform, international trade, and federal deregulation. 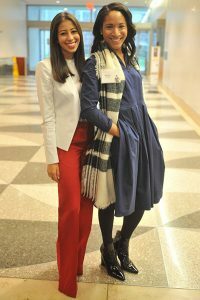 Lawsuits involving fashion and intellectual property have made big news over the past year, and Professor Scafidi began the first panel by noting that on the same day as last year’s symposium, the Supreme Court met and decided to grant certiori in Star Athletica v. Varsity Brands, a copyright infringement case involving cheerleader uniforms. 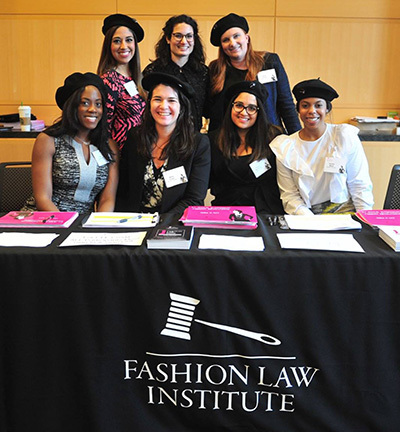 The Fashion Law Institute filed an amicus brief in support of Varsity, the copyright holder, with panelist Michelle Mancino Marsh ’96 of Arent Fox serving as counsel of record, and the week before this year’s event the Court handed down a victory for Varsity. The panel, including Anna Dalla Val of Ralph Lauren and Maurice Ross of Barton LLP, representing designer Jenny Yoo, discussed additional pending cases and expressed optimism regarding the future of intellectual property litigation for brand owners. Up next was a discussion of retail technology, moderated by Adjunct Professor Paula Barnes of Macy’s. A diverse group of panelists including Diana Bernal of Richemont, Daniel Plenge of Plural NYC, Janett Martinez of Loomia, Kenya Wiley of the Fashion Innovation Alliance, and Po Yi of Venable considered the relationship between “bricks and clicks,” reminding the audience that the success of both in-store technology and online interactions often depends on the human element. Adjunct Professor Jeff Trexler led Claire Bing of Tarte Cosmetics, Hilary Jochmans of Jochmans Consulting, Kenya Wiley of the Fashion Innovation Alliance and Fordham Law alumna Sara Yood ’11 of the Jewelers Vigilance Committee in the panel concerning deregulation. Wiley and her co-panelists offered several strategies for maintaining an active voice in the federal rulemaking process, emphasizing the importance of keeping a watchful eye on regulations posted to the Federal Register. Another panel, again moderated by Trexler, took up the topic of international trade, which the Trump administration has turned into a fraught topic for anyone retailing goods in the United States. “The whole concept of trade and politics getting involved is like making sausage: it’s not pretty but the end result is usually pretty good. So I think in the end everything will balance out,” said panelist Don Obert of the Obert Law Firm. Co-panelists Anne Borkovic of Akin Gump Strauss Hauer & Feld, Marc M. Levey of Baker & McKenzie, Roberta Portella of RPortella & Associados, and Stephen Sidkin of Fox Williams expressed similar hopes that the markets would seek homeostasis, and also misgivings about some of the policies currently under consideration in the White House and Congress. The day’s final panel concerned the fashion community in New York City. Moderated by Doreen Small of Marquart & Small, also an adjunct professor, a panel composed of Julie Fredrickson of Stowaway Cosmetics, Melissa Hall of the Emerging Designer, Christine Helm of the Fashion Institute of Technology, designer Nanette Lepore, U.S. Congresswoman Carolyn B. Maloney, and Gary Wassner of Hilldun Corporation discussed the fashion community’s vibrancy and the challenges it currently faces. Lepore and Wassner said that despite the industry’s vibrancy, it faces challenges related to New York City’s shift away from its industrial roots. Both Lepore and Wassner championed the preservation of New York City’s Garment District, a 10-square-block section of Manhattan that until recently served as both the creative and manufacturing hub of the city’s fashion industry. In closing, Lepore related an anecdote that epitomized the day’s intersection of fashion and law.